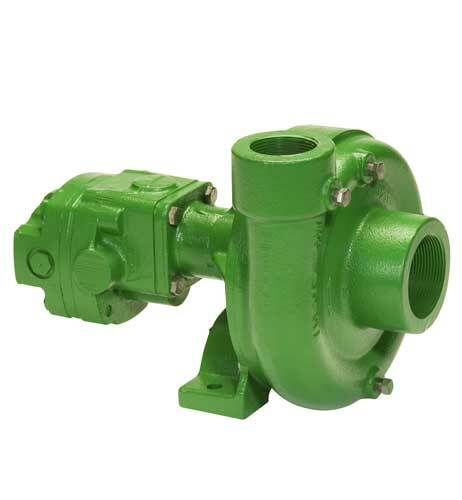 Centrifugal pump design provides good resistance to abrasive solutions and extra flow for agitation. The advantages of the hydraulic motor driven pump are mounting versatility, customized performance, and ease of maintenance. All hydraulic driven pumps are equipped with a stainless steel shaft and wear ring for excellent corrosion resistance. 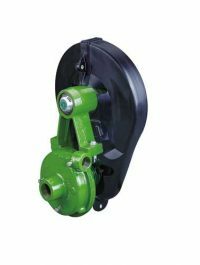 MOUNTING VERSATILITY: The location of the pump is not tied to the PTO or engine drive shaft; the pump can be mounted in a variety of locations to suit application requirements. CUSTOMIZED PERFORMANCE: The performance is dependent on the supply of hydraulic oil to the motor and not necessarily tied to engine speed. 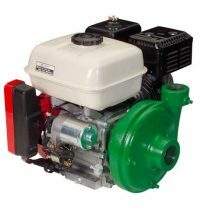 A hydraulic driven pump can produce higher pressures than PTO or belt driven pumps. They can also hold constant pressure at varying engine speeds on closed center hydraulic systems. EASY MAINTENANCE: On a hydraulic driven pump there are no belts to align or break. 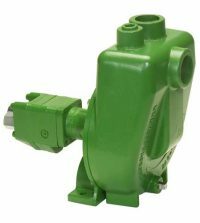 Separate pump and hydraulic motor shafts simplify repair and replacement. Two main pump bearings support shaft loads. 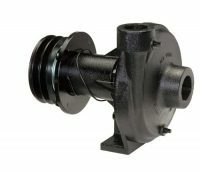 All pumps are equipped with easily replaceable Viton® mechanical seals.